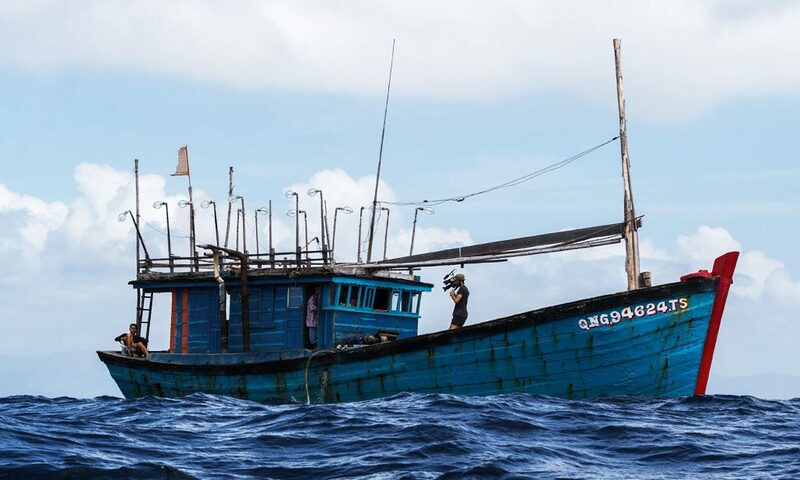 Our fisheries enforcement, training, and marine conservation work has always needed boats. To enforce a marine protected area for example, you must have a means to get on the water and inspect fishing vessels. In the early days we would lease or charter local fishing vessels, however these were often unsuited to the work. A few years ago we made the decision to get our own vessels, with some of these detailed below. In terms of fisheries training, we use our ship the Modoc as a floating training center, and we then deploy onto the Willard 7.4m Tactical RIB, and also the smaller Zodiac MilPro FC-470. Similarly for fisheries enforcement, we use a combination of the Modoc, RIB, Zodiac (and the Schiebel UAS), depending on the situation. Below are details on these and other vessels we’ve deployed with. Our Zodiac MilPro FC-470 was sponsored by Zodiac in 2013, and has been an integral part of many of our successful fishery campaigns. These amazing vessels have been the backbone asset of many maritime special operations units, largely because they have so many advantages over conventional craft. Firstly, they are extremely safe, with a total of 8 compartments that can be inflated quickly from one point (in our case a dive bottle). They have a small radar signature, and can generally infil and exfil an area without being detected. They are easily concealed on a beach, and can also be sunk and re-floated as seen in the video above (we’ve yet to do this). They are small and light, and can be transported around on a pickup or the back of a decent car. They can fit inside a moderate sized helicopter, or deployed out the rear of a C130 Hercules while flying. Finally they are robust. Our team literally destroyed a cheap Zodiac knock-off in a single 3-month period running patrols in the Philippines, and yet our original Zodiac FC-470 is still going strong. Our Zodiac remains one of the assets on the Modoc, and we use this in both training operations of local units, as well as selected fishery patrols. Sealegs generously sponsored us the first of their military amphibious craft in 2013, and we used this extensively through Central America and Asia. The big advantage with the Sealegs is it can launch and land on most sand and pebble beaches, and even some quite rocky shorelines. Being a RIB, it has inflated sides, making it ideal for boarding vessels quickly, quietly, and without damage to either vessel. It is fast, has good sized fuel tanks giving it a long range, and is an outstandingly well designed and built craft. We took our Sealegs all the way to Cocos Island, a voyage of over 300 nautical miles, that remains one of the most challenging missions we’ve ever made (more). We also used this boat in the first big bust of our original Costa Rica campaign, where we covertly filmed a vessel for 7 hours bottom-trawling in a marine protected area (the captain turned out to be the president of the local Fisherman’s Association). We remain extremely grateful to Sealegs for supporting us with this craft, and it was an integral part of our operations for many years. We recently invested in a Willard 7.4m RIB that was formerly deployed with the US Navy SEALs. This is now our principal vessel boarding platform. One big advantage with this vessel is it’s drivetrain – The engine is a Cummins Diesel 230hp, giving us tons of torque, through a rock-solid Konrad drive. The vessel is fast, reliable, robust, and like any vessel operated by US Navy SEALs, is proven in the rigors of maritime operations. We use this vessel in many of our fishery enforcement missions, as well as in training maritime units. We still regularly charter or borrow local fishing vessels. The main advantage is such vessels can be very low profile. Fishermen (legal or otherwise) seeing us assume we’re just another fishing vessel. It allows us to move seamlessly through waters determining which vessels are likely illegal, and then boarding only those really worthy of further inspection. Normally we charter the local vessels, however the one above was in fact a confiscated vessel where the fishermen were flown back to their home country, and the local authorities gave us permission to deploy it on joint patrols for a limited period.